This is a delicious dish, a complete contrast from the sago milk pudding that everyone hated so much in school dinners! You must follow the instructions exactly or you will end up with a gluey mess!! Do not reduce the quantity of oil or you might get a sticky, lumpy mess. Making time: 20 minutes (excluding soaking time). Serves 2 for a meal and 4 for a snack. 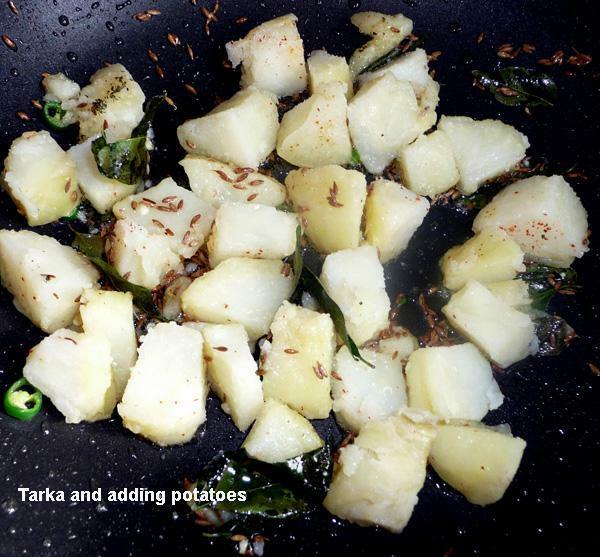 Note from Reeta Kumar*: You can add 1-2 medium potatoes to this khitchri. Boil, cool, peel and dice into small cubes. You can add a cup of frozen or boiled peas. Add at step 8, just after adding cumin and curry leaves. 3-4 tbs. Cooking oil. Less oil makes it gluey/sticky! 2 green chillies, finely chopped (without seeds). Adjust to taste. You can use dry red chillies instead. Juice of 1/2 lemon. You can use 1-1 1/2 tsp. bottled lemon juice. 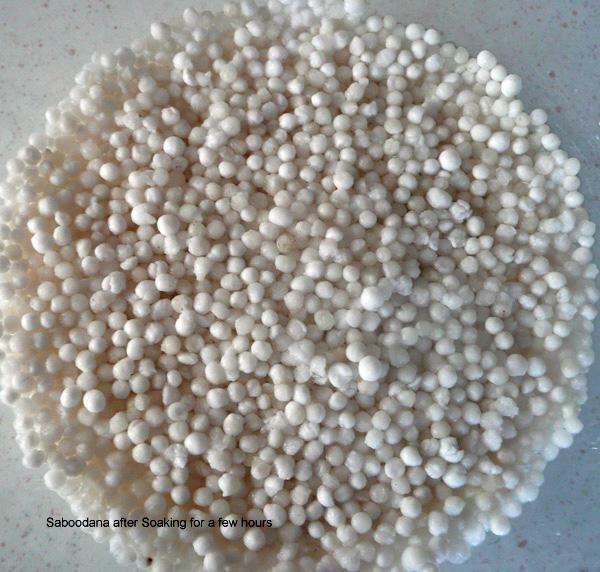 Wash the sago in a bowl in running water three times. Fill water up to 1/8th inch above, no more, the level of sago. Cover and let it stand for 2 hours. 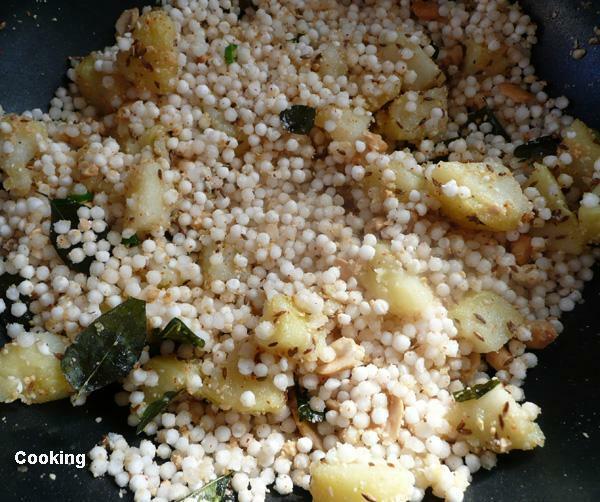 Before cooking, lightly fluff up sago with a fork, to loosen each grain. 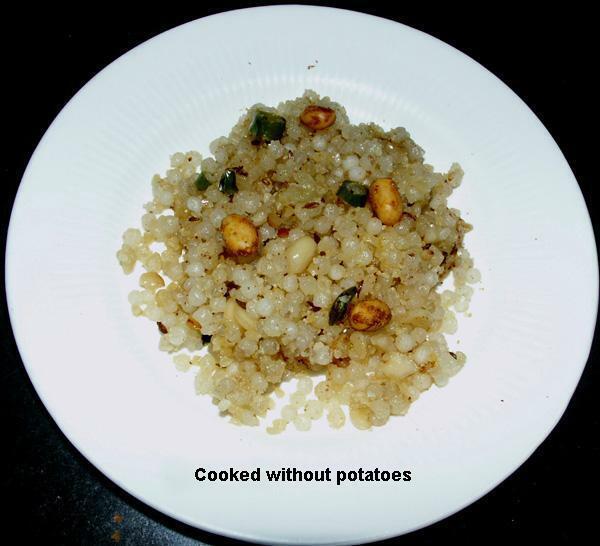 If it does not break up into grains, this means that you have added too much water and the dish is already ruined. Do not waste other ingredients by trying to cook it and hoping that it will be okay. Put it down to experience and start again with fresh sago. Also see note 1 below. 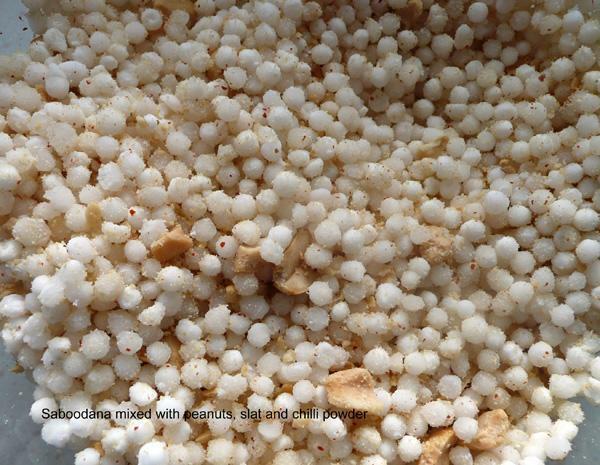 Add salt, chilli powder, coriander leaves and peanuts to the sago and mix well with a fork. Heat oil in a non-stick pan or wok. Add cumin seeds and curry leaves and wait until seeds splutter or turn brown. Add chopped green chillies, stir for 5 seconds. Add potatoes* here, if used and stir fry for a few minutes. Add sago mix, stir gently with a wooden spatula, till well mixed and hot. Cook covered on low heat for 5 minutes, stirring frequently. 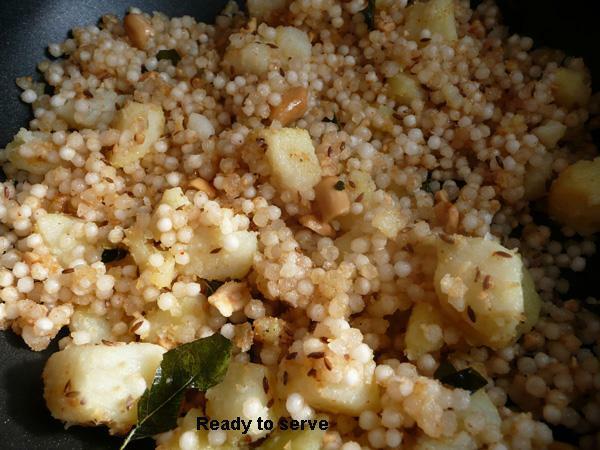 Sago is ready, when it most of the grains looks translucent and light brownish. Some will remain opaque. It takes only a short time to cook, so don't go and do other things while this dish is cooking. Squeeze and stir in lemon juice. 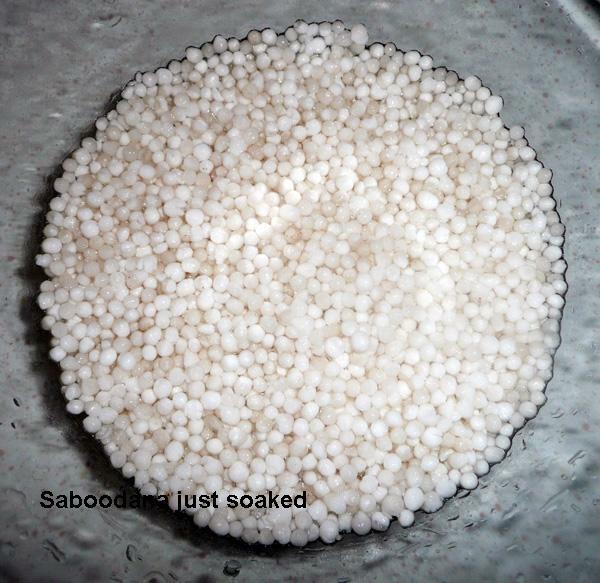 Soaked sago that is a little bit clumpy, can be improved by spreading on a thick paper towel (a couple of layers). This will soak up some of the excess water. If sago looks dry and separated at the end of this process, you can proceed with the above recipe from step 5. *Sago is the farinaceous (mealy) substance produced from the pith of Metroxylon and other palms. 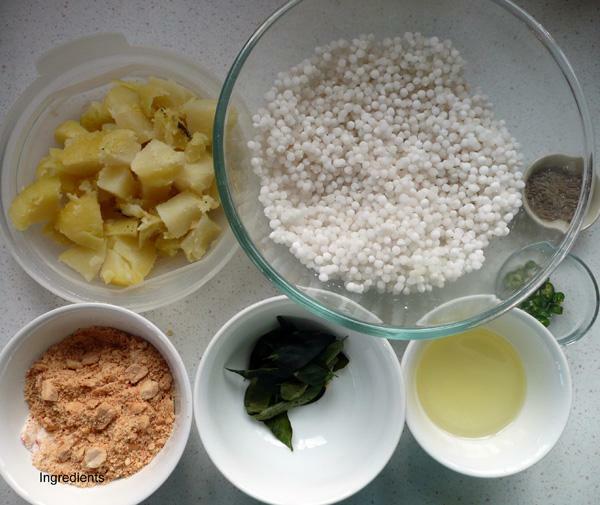 Tapioca is the farinaceous substance produced from the cassava. They are identical to look at and either can be used for this recipe. It can also be served with natural yoghurt or dahi.